That, and the rising price of gas, suggests that a bike is a more ideal mode of transit for many students. But bikes are expensive, especially if you're already making car payments, insurance, and paying for gas. 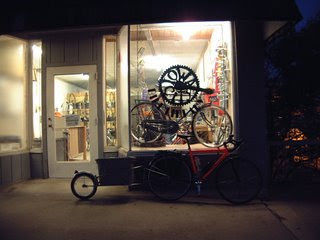 The Bike Library is a volunteer-run community bike project located in Iowa City, IA. We repair donated bikes and check them out to the public. Bikes are priced with a deposit (ranging from $20-$80). If a bike is returned in good condition within the six-month checkout period, the full amount of the deposit will be returned to the user. Alternately, patrons can choose to keep their bikes and forfeit their deposit.